Connectagons Building Sets Add to Flipboard Magazine. Children’s work is to play. 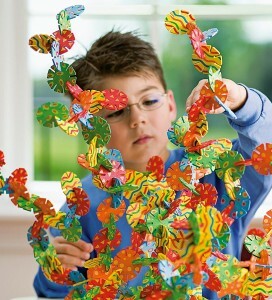 This is one toy that will allow them to play and learn without even realizing that they are learning. Connectagons are wooden circles multiplied by 8 slots each multiplied by 5 bright colors and countless patterns of circles, stripes, dots, and diamonds. Children of all ages can learn very quickly how to build with these. Building with connectagons can take your kids all over the place. There are no rules. You will be amazed at how quickly they learn to let their imaginations run wild and design structures that will delight them. These are created for children 4 and up. The whole family can participate in building with Connectagon. It is contagious fun.